Y’all, I have found a new slice of paradise for outdoor enthusiasts and families! 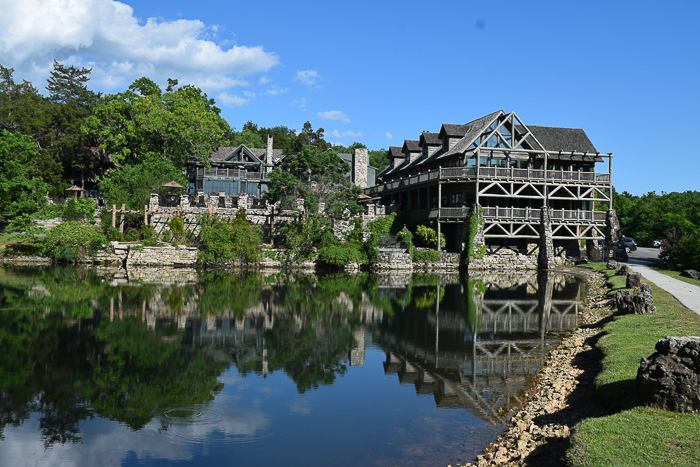 Big Cedar Lodge in Branson, Missouri. 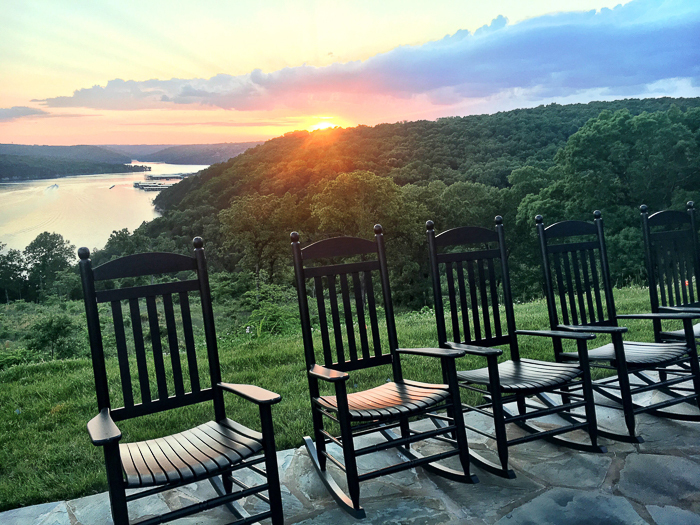 Billed as “America’s Premier Wilderness Resort”, BCL is on Southern Living’s South’s Best list for 2019. Brandon and I went there for a wedding this last May and there is outdoor recreation available for all ages and interests. 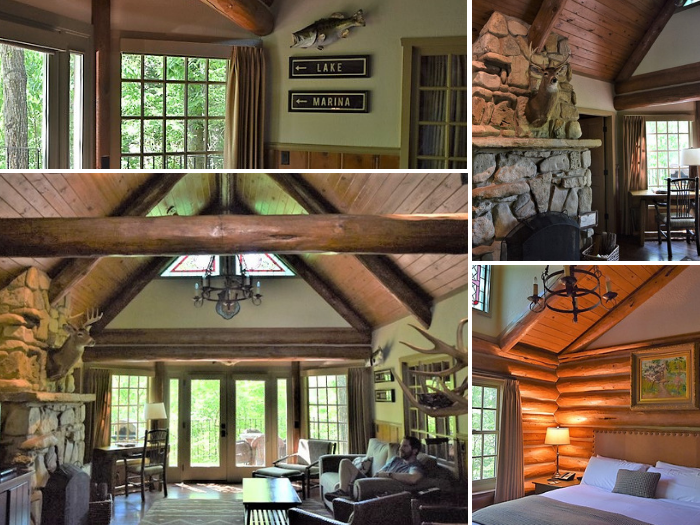 While there’s plenty to do for outdoor lovers, the accommodations are comfortable enough that the entire family can enjoy it. 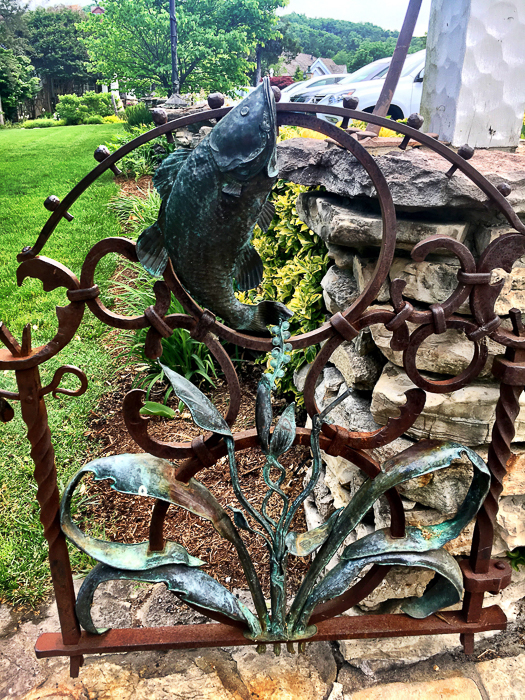 Big Cedar Lodge was built by owner of Bass Pro Shops, so there are fish everywhere—either painted, welded, or engraved into nearly every flat surface on the property, from the parking lot stripes to the wood clothing rods in the closets. 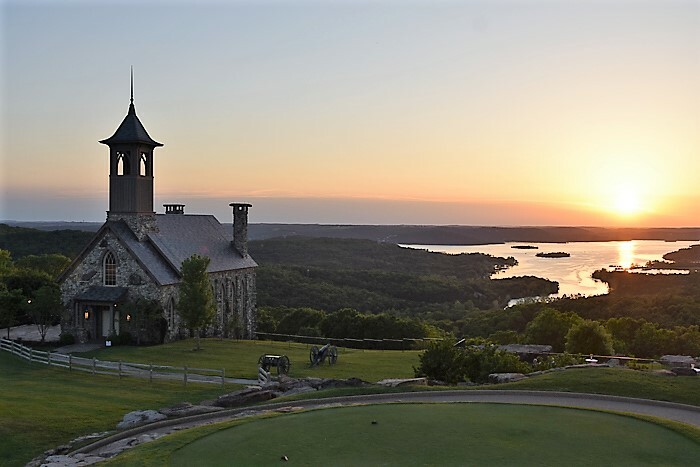 The resort sits on a hill above Table Rock Lake, where there is a marina, small beach, and a pretty walking trail on the edge of the lake. 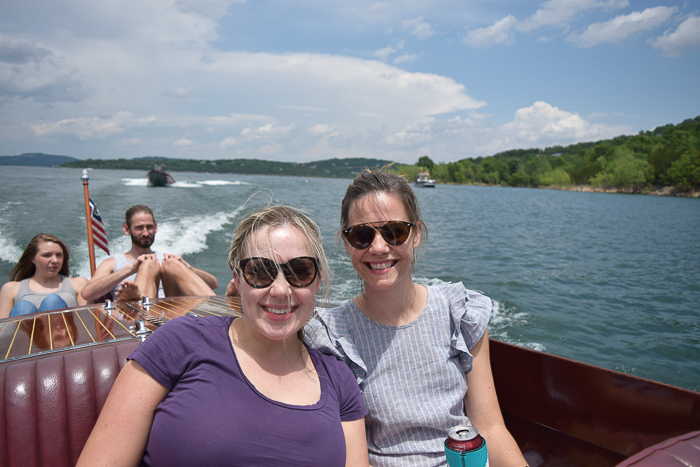 On the morning of the wedding we booked a lake tour in a little wooden motor boat called the Goin’ Jessi, which was once owned by Waylon Jennings. You can book it here: Table Rock Lake Marina or by calling the resort. I was 5 months pregnant at the time, and it was sweltering, (there was no shade on the boat) but it was fun nonetheless. 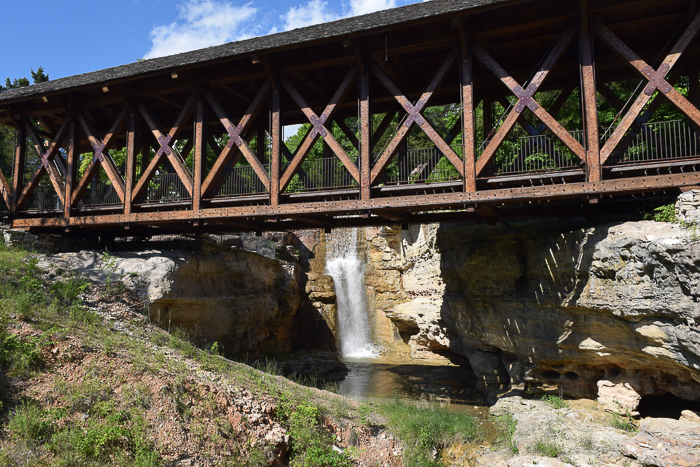 It was very affordable and it didn’t require much time, which was a huge plus given all there is to see and do at the resort! 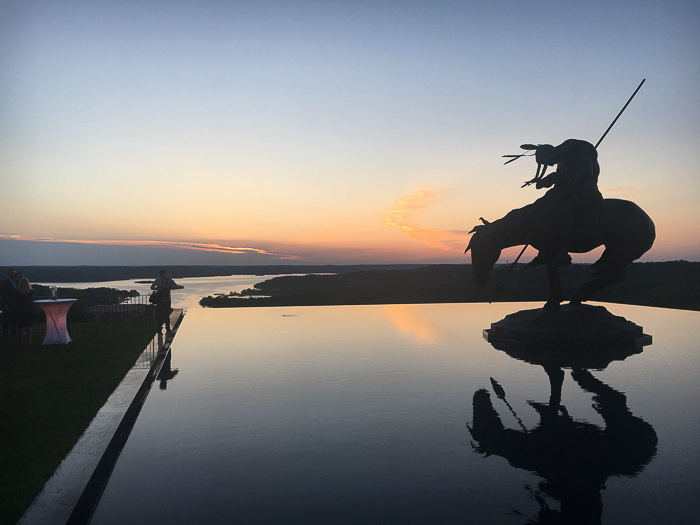 The highest point of the property, “Top of the Rock” is a must-see and has a museum, restaurant, chapel, wine tasting room, and reception area and is absolutely stunning–a place you will not want to miss! At sunset, they play bagpipes out on the lawn and it is magical. For my friend’s wedding, they fired off a canon as we all came out of the chapel. Top of the Rock also has a huge Native American artifact collection to see if you’re into history. We stayed with some friends in one of the cutest log cabins I’ve ever seen! It looked like something out of a Ralph Lauren ad. I can only imagine how charming it is at Christmas time, which supposedly is a great time to visit the resort. It had a fridge and a kitchen and would be perfect for a family to stay in. 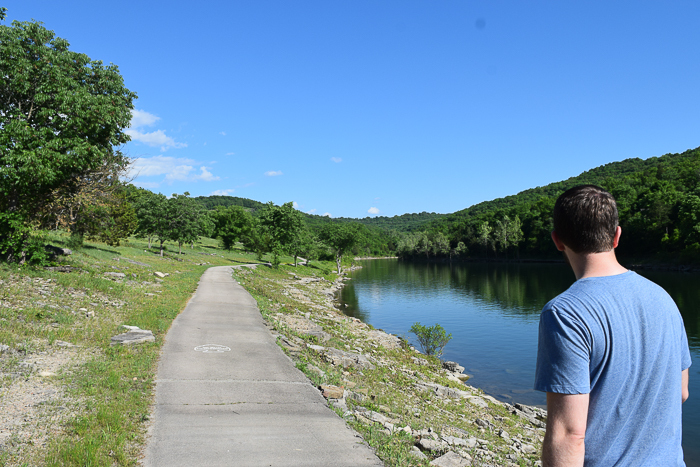 We enjoyed getting our morning coffee and strolling along the paved walking trail that connects the cabins and the main lodge. Its not too long and would be doable with a stroller. The gift shop is pretty good, especially if you are looking for some cute outdoorsy themed things. While the rest of the resort is all about doing things outside, Fun Mountain is the perfect place to go with kids on a hot or rainy day because it’s inside and air conditioned! There are bumper cars, a low ropes course, arcade games, laser tag, a golf simulator, and the most unique bowling alley I’ve ever been to. Everything including the guns are provided! It’s impossible to cover it all in one post! 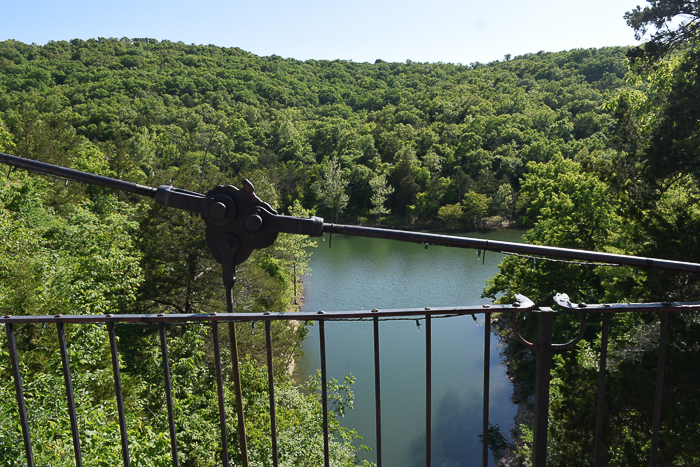 But there is golf, a cave to tour, bowfishing, yoga and other fitness classes, swimming, and archery. Don’t worry–you will not get bored! There is SO much to do–I would allow at least 3 full days not including arrival/departure. This is a very casual resort and you will be fine in your comfy clothes! I would be sure to bring low top hiking shoes or tennis shoes because you will do a lot of walking. Fly — you can fly into either Springfield or Branson. Branson is the closest and Springfield is about 45 minutes away. We need one of these places in Texas but until that happens I will have to return to Missouri. I can’t wait to take my little boy and do all of these things when he is old enough! 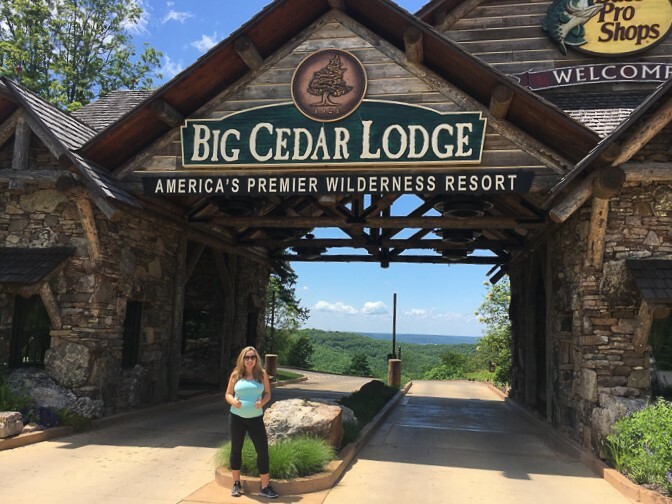 6 Replies to "Our Stay at Big Cedar Lodge, America's Premier Wilderness Resort"
You are absolutely right! 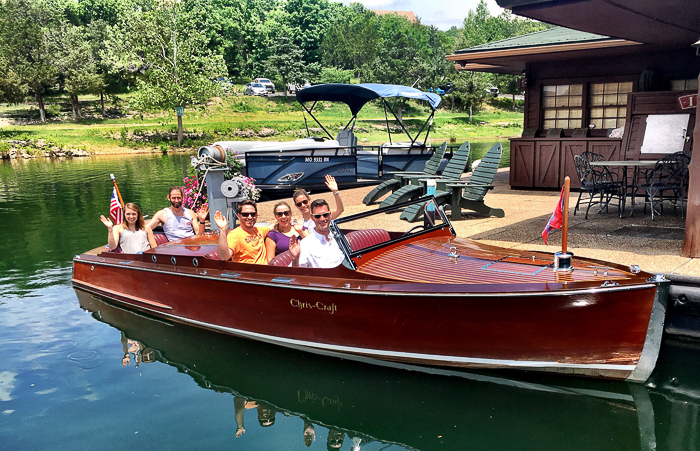 Big Cedar has been a family favorite for years! The food at the resort restaurants is exceptional, too. Via airlines has some very reasonably priced direct flights from Austin during some times of the year that fly direct into Branson. So glad you guys enjoyed it! Yes we need to go back!! We have this trip on our bucket list. Thanks for the review. Yes. We’ve been going there for 20 years and we have watched it grow over that time! Lots of good family fun there. Love it.